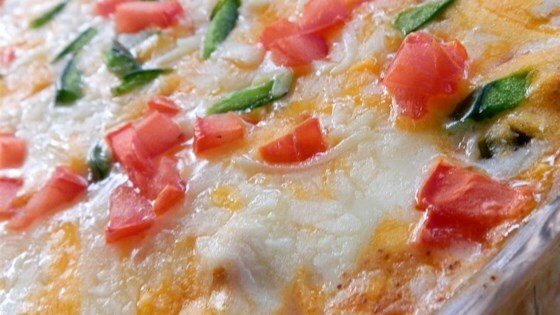 "This is a version of the famous King Ranch Chicken casserole. Careful, it packs a bit of heat!" Lightly grease a 9x13-inch baking dish. Spread corn chip crumbs over the bottom of the baking dish and press crumbs into place. Melt butter in a large skillet over medium-high heat; cook and stir onion in melted butter until tender, 6 to 7 minutes. Stir diced tomatoes, cream of chicken soup. cream of mushroom soup, green chiles, milk, sour cream, chili powder, and cumin in a large bowl. Add chicken and cooked onion; stir to combine. Pour mixture over corn chips and top with Cheddar cheese. Bake in the preheated oven until bubbly and cheese is melted, 55 to 60 minutes. Let stand for 10 minutes before serving. Feel free to use Cool Ranch Doritos® and use Ro*Tel® tomatoes in place of the canned tomatoes and green chiles. More like the consistency of a dip... not a casserole that kind of holds its shape. Very soupy. This is really good! I used rotel so it’s a little too warm for my husband but I loved it!. I WILL make it again! Made a few tweaks used both cheese & cool ranch chips, Mexican cheese, no chili’s~ just those in Rotel. Added organic tomatoes as garnish on top.